In SharePoint List, I have create Check boxes with three option in Choice Column. Now, How to disable two options when one is selected in new form? I tried by using this Link, but no use. We can use Radio Buttons field to instead of Checkboxes field. 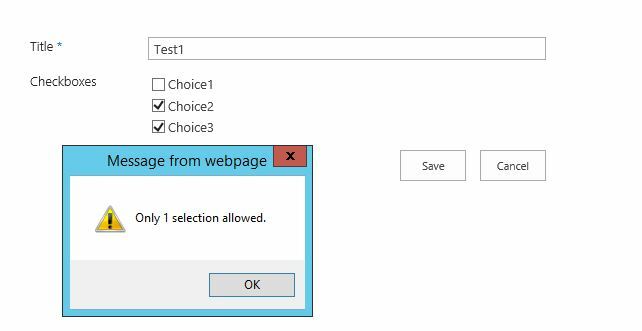 If you still want to use Checkboxes, we can add the following code to script editor web part(2013/online) or Content Editor Web part(2010/2013/Online) in new form page to achieve it. Note: Modify the field column name in the code below. Not the answer you're looking for? Browse other questions tagged sharepoint-online jquery splistitem or ask your own question. jQuery - How would you display / hide content with a radio button based on a date?